It’s DIY time over here! I am addicted to Pinterest, and I love finding cute, adorable DIYs that I can do. They make things unique and add a personal touch to your wardrobe, or room. While browsing Pinterest, I came across this picture of a super cute scarf, with the description “Arm Knit Scarf, Tutorial.” When I followed the link it led me to Small Home Big Start’s “Friday Favorites” post. From there I finally got to the basic tutorial for the cowl, from Simply Maggie. Simply Maggie has an awesome video tutorial, and between that, and my sister’s knitting experience, I got started. I have NEVER knit in my life, but I must say, arm knitting, (meaning on a bigger scale), seems easy to me. 3 Skeins of Lion Brand Yarn, super bulky weight, in the color (Hometown USA) Dallas Grey. I love this yarn because it’s made in the USA. I used 2 skeins for the scarf itself, and one for the button piece. There was tons left over from that, but not enough left over from the scarf to do that piece. I cast on 12 stitches, and then just went for it. Once I got the hang of it, it moved along quickly. I think part of the key is to keep the stitches snug around your wrist, and continue to maintain a consistent tension throughout the process. The beginning of my scarf is definitely looser than the ending side – my skills improved quickly with practice! Here’s a look at the scarf stretched out during the knitting process. I love that it looks like a fishing net in a way. When I finished knitting (I used 2 full skeins of “super chunky” yarn), I cast off, and then “sewed” the ends together to create an infinity scarf. 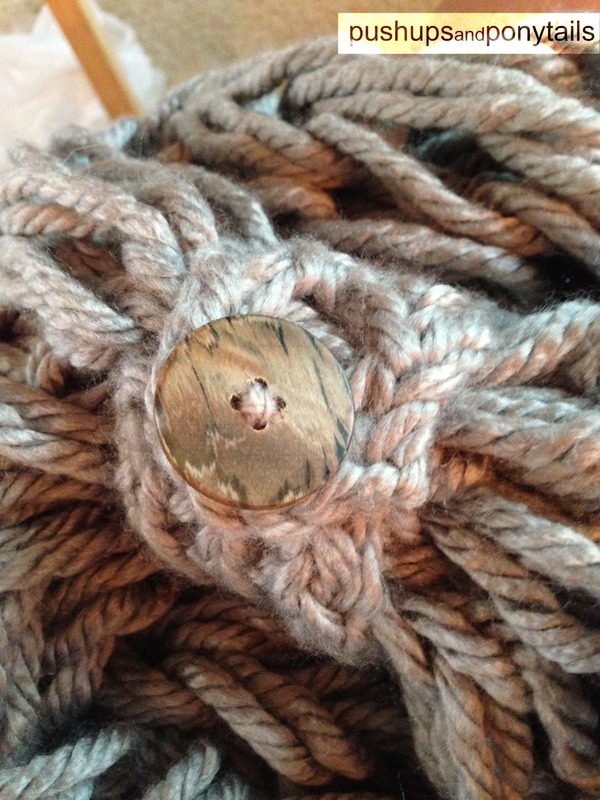 While I was working, my knitting-pro sister made this adorable feature (as seen in the photo above). It’s a simple step – if you know how to knit; but adds so much personality to the scarf. Unfortunately I couldn’t tell you how she made this, what needles she used, or anything. And the final product! I love how thick and chunky it is, but there’s still a lot of space for air to flow where it doesn’t keep you TOO warm. The perfect scarf to layer over a longsleeve shirt, like a henley in the fall months! What other arm knitting projects should I try? I think I want to make a throw for the couch next using this tutorial and yarn (again from simplemaggie). I just found her site but I LOVE the stuff she creates!